On the morning of Sept. 17, 2018, Opening Ceremony for Freshmen was held at SSPU gymnasium. 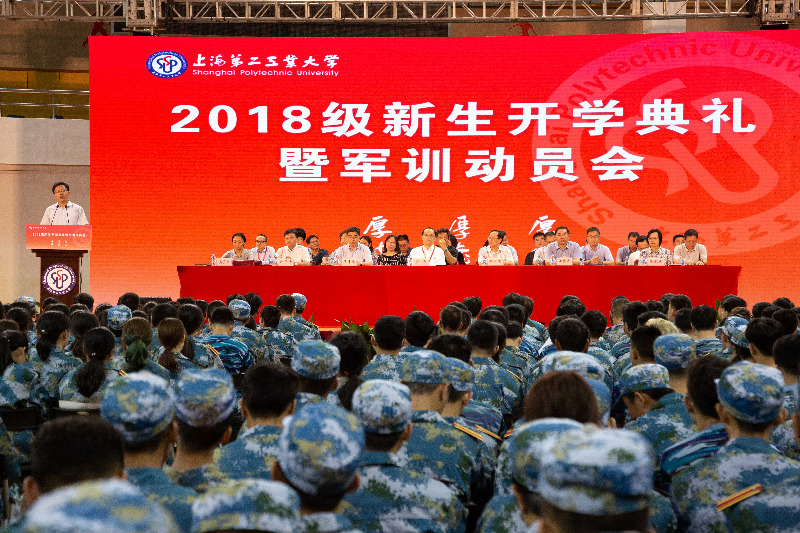 The university leadership Yu Tao, Zou Longfei, Wu Peidong, Mo Liangjin, Xu Yufa, Xie Huaqing, and Xu Yufang, heads of Colleges and Schools, 2018 freshmen, parents and teacher representatives attended the ceremony. Vice President Mo Liangjin presided over the ceremony. President Yu Tao made an enthusiastic speech on the ceremony. At the beginning, President Yu, on behalf of all teachers and students, warmly welcomed over 3600 freshmen from all over the country and international students from South Africa, Mongolia, etc, and expressed heartfelt gratitude to the teachers and parents. He introduced SSPU’s orientation, training objective and future development to the freshmen. Focusing on the two key words reform and opening-up, he also briefed the achievements made in continuous comprehensive reform on education and the all-round practice of internationalization. In his remark, President Yu put forward 3 anticipations for the students —Study actively, Create and Innovate bravely and Pursue Excellence. All the students should set up a high standard and be strict to themselves, and choose a right path toward the best. Teacher and counsellor representatives, freshman and senior student representatives gave speeches on the ceremony.